Hunt Groups are used to manage calls and can be setup in a variety of ways. By default, a hunt group 200 called Main is created with the first 10 users as members. Different call schemes are available and extensions can be added or removed as required. There are also options for call overflow, options for Fallback, voicemail and recording. Collective – All available phones in the User List ring simultaneously. Collective Call Waiting – This is a Collective hunt group as above but with hunt group call waiting also enabled. 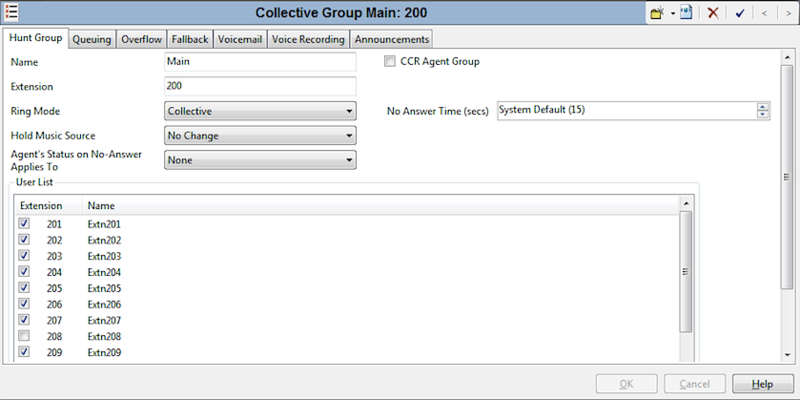 When an additional call to the hunt group call is waiting to be answered, users in the group who are already on a call will receive call waiting indication. On phones with call appearance buttons, the call waiting indication takes the form of an alert on the next available call appearance button. On other phones, call waiting indication is given by a tone in the speech path. Sequential – Each extension is rung in order, one after the other, starting from the first extension in the list each time. Rotary – Each extension is rung in order, one after the other. However, the last extension used is remembered. The next call received rings the next extension in the list. Below, extension 208 is a member of Group 200, but not currently logged in.